It is with regret that we advise that Eric McIntosh, Life Member of the NZ Radio DX League, passed away in Invercargill on Tuesday 2nd, September, 2008. The League expresses its deepest sympathy to his wife Phyllis, daughters Bernice, Virginia, Erin and Ainsley and their families. A floral tribute and message of sympathy was sent to Phyllis McIntosh on behalf of all members. A number of tributes to Eric have been received and we publish these here. RAY CRAWFORD writes – “To those who knew him, Eric was a wonderful friend, good DXer and always willing to pass on the knowledge and experience gained in some 60 years in the hobby. Those in the Southland Branch, along with numerous others in NZ and Australia, owe much of their ability in the hobby to having had close contact with him. “Eric was a watchmaker by trade and in his little shop in Invercargill you could always pop in for a chat about what was being heard. He was well known for his cycling around the town. One time he biked some 25 miles out to Riverton Rocks in teeming rain and a howling southerly to log KMTH on Midway Island on a DX Special. His dedication in rising to a challenge was second to none. In the 1960’s he had a little holiday house at the Rocks and many a DX session was held to log African stations on the shortwave bands.“He was the Treasurer of the Southland Branch for more years than can be remembered. If you were not financial then it was not long before he was chasing you for the fees. “Eric had a vast knowledge and many enjoyable hours would be had in deep discussion about any subject raised. It never ceased to amaze even those who had known him for almost a lifetime that he could come up with subjects that one had never thought he would be interested in. His recollection of events, names and dates was truly outstanding. 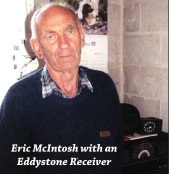 A tribute from STUART FORSYTH – “I was greatly saddened to learn of the passing of Eric McIntosh, League life member and an all-round wonderful man. Yet another link in the chain of League history has been broken. I first met Eric in 1978 when I travelled to the AGM in Invercargill. The Southland Branch in those days was a powerhouse. Mervyn Branks, Arthur Cushen, Raymond Crawford, Sutton Burtenshaw, Steven Greenyer, Arthur Williams and Paul Aronsen were the names I remember. Going there as a callow 20 year old was an experience and one I was a little intimidated by. Eric was one of the first people I met and straight away I warmed to him. He was a kind, self-effacing man, whose opening greeting of ‘what have you been hearing?’ still echoes in my ears today. Indeed he asked the same question whenever I met him subsequently. To a nervous young man he was encouraging and seemed to take a genuine interest in what I was doing. In the past few years, prior to moving abroad, I travelled to Invercargill regularly, usually in the company of Ray Crawford. A visit to Invercargill wasn’t complete without a visit to Eric and Phyllis. I was staggered to discover that this good Baptist was actually a fan of horse racing. He never had a bet, never set foot on a racecourse, but was responsible for looking after the stopwatches of some of Southland’s leading trainers. From them he learned the form and followed their horses keenly. His main interest was in harness racing (trotting) and I know he followed the fortunes of the horses I have a part ownership of.